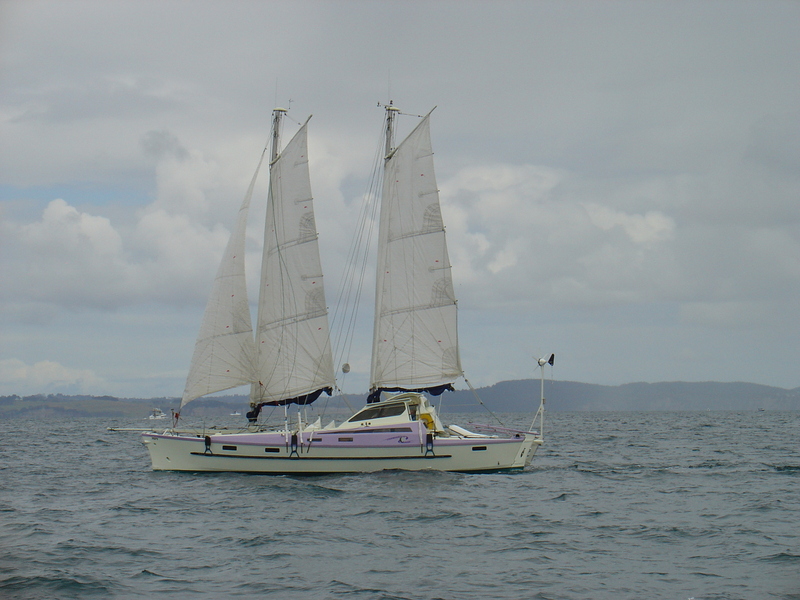 Hi David, I have had so the same idea : before to leave the NZ in February 2018 I bought the B. Kohler plans of the micro catamaran ECOnomy 5.50 cruiser. In a few years, after to have sold my Tiki 46 I plan to explore the protected coasts, estuaries, rivers and lacs of Europe in towing a such little cat behind a little car as her empty weight is only 290kg. Despite I stayed 10 months in France, I did not yet find the time to begin her building. At the end of this month I'll be back on board Grand PHA to prepare her re-launch after new bottom painting and to have re-rigged her new sails in junk rig. Hello Bertrand, nice to hear from you. I am looking forward to getting my little catamaran finished and sailing, maybe sometime in 2020. I have almost finished the hulls, just one more hull panel to do on each hull. Once I get that done and some sanding completed I will post some more photos. Hey, David, it looks like you are making fantastic progress and you seem to have limitless energy. Send some my way, will you? Slow but steady progress over the past two weekends. Last weekend I faired the framing ready for the plywood. There was a lot of material to come off the keel , especially in the forward parts of each hull. An electric plane was used to remove the bulk of the wood, but followed up with a good old Jack plane for final finishing. And of course the 4 inch angle grinder with coarse pad helped out a lot. This weekend I glued on two plywood panels. These are probably the biggest single gluing job in the whole construction - not helped by the fact I am using fast hardener in summer temperatures! I need to go shopping for more resin, and plywood. There is probably about 3 hours work in each hull panel. Measuring, cutting, sanding the inside surface, 2 coats of epoxy sealer, which then needs to be sanded down. Then the final gluing onto the frame operation. There will probably not be a lot of progress over the next couple of weeks as I am hauling 'Footprints' next Friday for a week of maintenance which includes removal of very old anti-fouling. Hopefully a week of full time work will see her back in the water the following week. 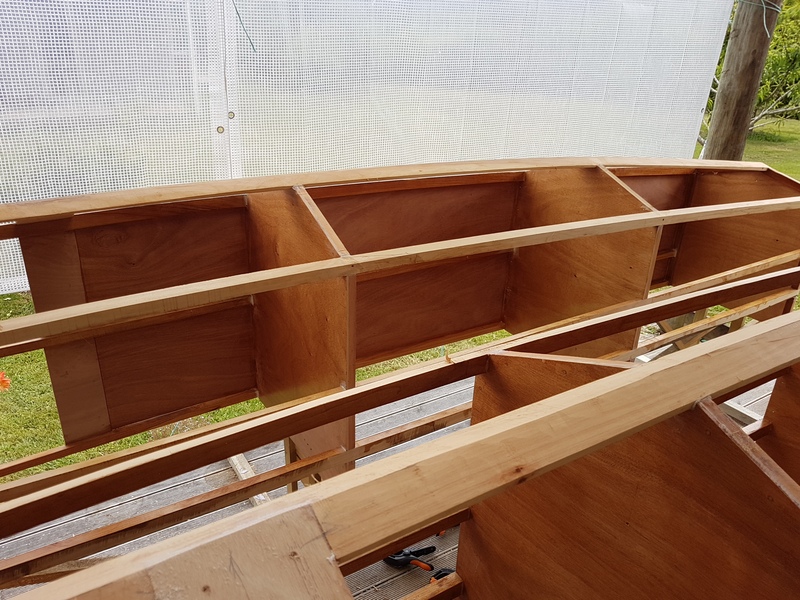 Then back into boat building, but with at least one day of sailing fitted into each weekend. Having finished the boat he decided there was no reason why he could not build his own sails. So he made some very nice radial cut, full length batten soft wing sails. I sailed on the boat a few times and I seem to recall it went well to windward, despite the long shallow Wharram type skeg. I like the idea of this type of rig because it is low tech, and I could do a lot of it myself. food for thought. I've not seen it done like this before, with full battens and two very deep reefs. It looks like a very appropriate solution for a small catamaran. PS: I just bought the study plans for the Eco 7.5. Need something a little bigger than the 6 for me to live on. May never get to build it of course, but if someone offers me 10K for Arion (fully equipped down to the JSD) I will have to look for a barn to rent! I'll choose the gunter/gaff rig with the head of the sail in a sleeve for sure. It may not be junky (and I love my junk rig) but it sure is funky! If I do build it, it will be a "quick and dirty" build. I'm too old, and have always been too impatient, to spend several years in the shed. Thanks for your comments. The 7.5 would have been a better boat for us size wise, but I would have never been able to get the 4.5 meter beam down our driveway. But the 6 meter length is a much more realistic size for someone building part time. I imagine the 7.5 meter would be at least half as much boat again to build. I am not building 'quick and dirty', but more'quick and appropriate'. 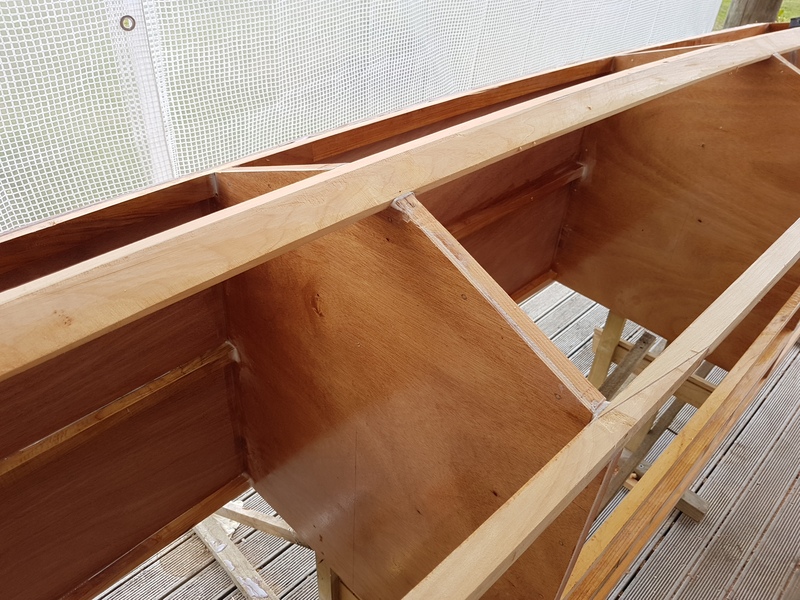 The boat will not be a piece of polished furniture, but it will be well built, strong, and with an appropriate finish. I am finishing everything as I go to the sanded and epoxy sealed stage. This will save a lot of finishing time later on. There is an Eco 6 being built up in Cairns and I imagine the boat will be well suited to tropical coastal cruising. 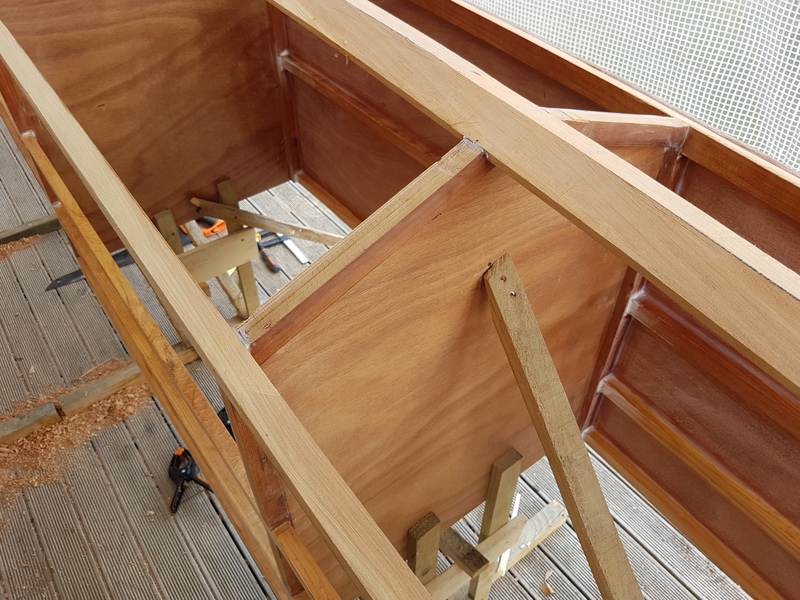 I chose the porch build location as it is the most level floor for setting up the hulls. When I begin assembling the boat I will need to move it into our big utility shed. The current location provides me with a lot of exercise because it is about 20 meters from my workshop, and on building days I am constantly going back and forth. In fact it seems that by the end of a building day a large percentage of my tools have relocated from the workshop to the boat, and then they all need to be put away again. I must have walked many kilometers already! Have you considered the Wharram pattern of wing sail, with a wrap around sail and a short gaff, plus a furling headsail? Designed for catamarans, after all's said and done. I wouldn't enjoy reefing it, but otherwise, I think I'd favour it over the gunter or flat-top bermudan. I have been thinking about the Wharram type wing sail as a possible alternative. A few years ago a friend did a very nice job of building a Tki 38 Wharram with the schooner rig. He modified the design quite a lot and did some offshore sailing on the boat. Having finished the boat he decided there was no reason why he could not build his own sails. So he made some very nice radial cut, full length and also shorter batten soft wing sails. I sailed on the boat a few times and I seem to recall it went well to windward, despite the long shallow Wharram type skeg. I like the idea of this type of rig because it is low tech, and I could do a lot of it myself. food for thought. Hi David. I love your new cat project. Funky design and for me the gunter rig looks fabulous, the perfect rig for this small light cat. When the main is deeply reefed or furled, it becomes a very snug rig. 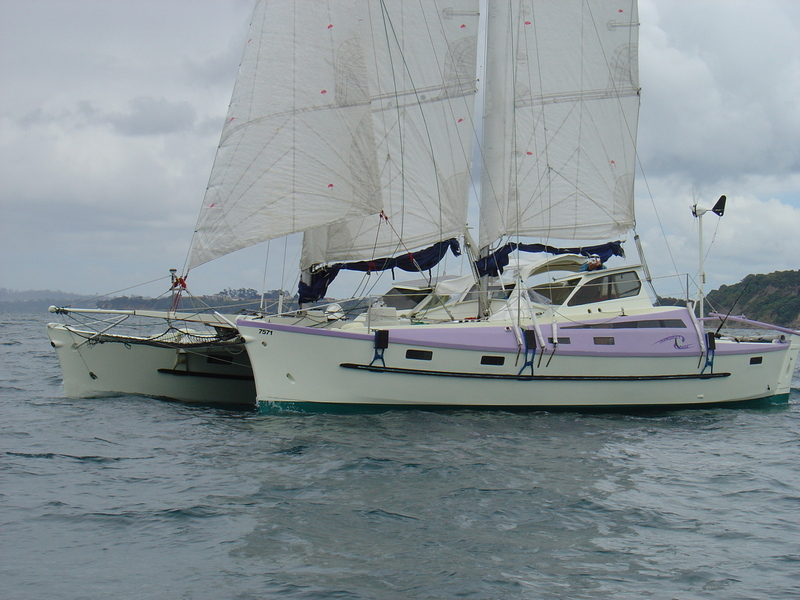 I have not yet been able to sell Arion (zero interest this side of the Tasman) but if I ever do, a small cat would be ideal for cruising the QLD coast. I also love that you are building both hulls on your back porch! Yesterday I was on a friend's Tennant designed Great Barrier Express catamaran, the so called Sports version, which is actually more of a cruiser, with a central cuddy and a double bunk in each hull. There are quite a few of them in QLD, but outside my price range at 60-80K. I've said many times there will be no more big boat projects for me, but a small, simple Kohler cat could tempt me. I'll be watching your project with keen interest.